The doubling of the earth's human population in the four decades between 1960 and 2000, from three to six billion, a population now on its inexorable way to an expected ten billion by 2050, is the proximate cause of the cataclysmic environmental changes that are upon us and which have marginalized geopolitical maneuverings, nationalistic grandstanding, the violence of ethnic and religious division and even personal tragedy. Our futures have been mortgaged to the unprecedented scalar transformation of our inhabitation. Our humanity – the very nature of our humanness is in question: Can we reasonably continue to celebrate it? A significant nexus of an unquestioning celebration of our humanity is occurring throughout the land in the nation’s liberal arts colleges. I recently attended the ceremony for Tulane's graduating class at the Mercedes Benz Superdome in New Orleans, Louisiana. The student our family was honoring had majored in Music with a minor in Philosophy from Tulane's School of Liberal Arts. The castle like stage-set (a recreation of the University's signature Gibson Hall, that dates from 1894, built in the Richardsonian Romanesque style and named for a Confederate General) formed the backdrop for the ceremony located somewhere in mid-field. We sat in the stands close to the twenty-yard line. On the dais were arrayed banners representing the schools within the University. A local jazz band kicked off proceedings. Faculty and the administrative staff were escorted into the arena by bagpipers - the Pipes and Drums of New Orleans. Somewhere, along the stage-managed and scripted proceedings there was an acapella harmony rendition of the Star-Spangled Banner, a piano concerto and a performance by the local soul singer, Irma Thomas, who was granted an honorary degree. Jesmyn Ward, the Mississippian writer and winner of two National Book Awards, gave the commencement address. During the event, which began at nine and wrapped up mid-afternoon, there were several outbursts from a small group in the audience chanting “Black Lives Matter” - which quickly withered under the shushing of an overwhelming white audience. The stage-seated faculty and administrators in their many-colored, medieval academic robes were predominantly white. The jazzmen, Irma Thomas and Ms. Ward represented the black faces at this ceremony held in a city that is over 60% black, while Tulanes’ student body barely tops 8% in African American enrolment. The University claims a high level of 'diversity' partly because of the number of different states from which it draws its (white) students. Such rites are replicated during the spring at expensive private colleges across the land and at public institutions that do their very best to mimic them. On display is an ethos that suggests humankind and all its works is to be celebrated and that Rationality, Science and Technology, gifts of the Enlightenment, exist to further the cause of human progress in the world. Although Romanticism lives on in liberal arts schools, as an early modern philosophical reaction to the Enlightenment and which continues to have relevance in its emphasis on imaginary, transcendental works of cultural production, nowhere is challenged the triumph of the species. Jesmyn Ward is a survivor of a Global Warming catastrophe. Her experience of Weather Terrorism, along with her experience of the poverty, injustice and prejudice of Mississippi (all exacerbated during and after Katrina) are the material of her fiction. 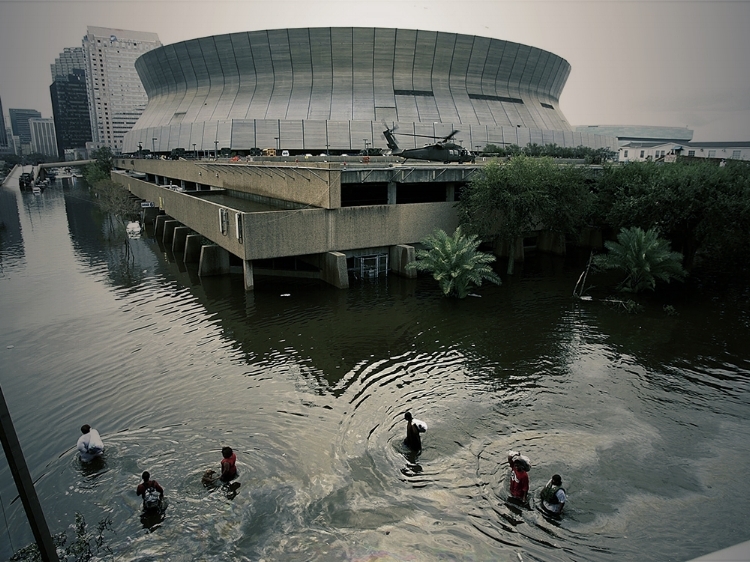 In the Superdome where, during the 2005 hurricane, New Orleans’ human detritus - those who had not evacuated and thus became homeless survivors of the storm - were gathered up by the National Guard and deposited in a stadium whose roof had ripped open and which notoriously became a quagmire of surging humanity, their waste, polluted storm water and mold, she spoke simply of her family’s struggles living in coastal Mississippi west of New Orleans. The one thought drummed into her by her parents and grandparents, none of whom had graduated from high school - needing to earn a living rather than continue their educations - was that college would set her free from the cycle of generational trauma, poverty, wage-slave drudgery, violence and drug-abuse. Her softly spoken downbeat message was that attendance at college (in her case, Stanford) was but one step in a long road towards achieving mastery in her chosen art form of the literary novel and of finally gaining admission into the predominantly white world of publishing after having her first book, Where the Line Bleeds, 2008, published by a small, exclusively African American press, Agate Bolden. The miracle of her success did not occur until she was well into her thirties. Speaking to mostly prosperous, mostly white students and parents, her words thudded into the vast arena as a message from another planet – the predominantly impoverished black communities of coastal Mississippi, where Ms. Ward still lives. This was not a speech about triumphalism. It was a speech about struggle. It was not a speech about progress, but about her momentary good fortune in rising above the mean. It was a speech about the survival of her spirit, tested first in the difficulties of her family’s circumstances, then in their survival of Katrina, and then again in her repeated rejection by the gatekeepers of literary fiction. “I always understood my ancestry, like that of so many others in the Gulf Coast, to be a tangle of African slaves, free men of color, French and Spanish immigrants, British colonists, Native Americans—but in what proportion, and what might that proportion tell me about who I thought I was?" The liberal arts continue to privilege human consciousness and its creative imaginings which in turn shape the dreams of secular humanism wherein our lives are supposedly bettered through technologically based development - much of which is projected to be 'sustainable' - although nothing in the human realm is sustainable if our population continues to metastasize across the planet. Biostasis, the ability of a species to survive change substantially intact, is now beyond our reach. Yet it is also out of the humanities that environmental criticism has emerged. It is at schools across the world that an understanding is emerging of humankind's intense enmeshment with the biosphere in ways that were entirely opaque until very recent advances in genetic analysis - advances that have now trickled down to the level of 23andMe. Cross-disciplinary thinking has thus contributed to the recalibration of the human/nonhuman hierarchy within the environmental humanities. As a species, we are newly aware of how thoroughly entangled we are with our bacterial biome, the nonhuman part of us which is greater than our specifically human genetic material. Ward is discomfited by her mixed ancestry. Lynn Margolis, the evolutionary theorist, biologist and creator, with James Lovelock, of the Gaia hypothesis, has shown us how we, as a macro-species, universally live in symbiosis with other micro-species. Our ancestral entanglements are thus compounded by the complexities of interwoven human and nonhuman biology. In her fiction, Jesmyn Ward tolls the sonorous bells of social and environmental realism. In her commencement address, she introduced Tulane’s 2018 white liberal arts graduates - acolytes into the narcissist cult of secular humanism – to the horrific notion that their degree might not be sufficient to distill the complexity of their lives into a speedy realization of their passions. That Life will not spare them.